C4C is overseen by a Board of Trustees made-up of highly distinguished individuals from the public and private sectors, both nationally and internationally. We were honoured to have two highly esteemed and respected business men become members of our Board of Trustees - Mr. Alex Onuegbu, MD/CEO of Brunnel Engineering and construction, and Eze Festus Odimegwu, Chairman FS Group of Companies. We are excited about the great things we will achieve with the support of this distinguished Board. Members include - Dr. Kechi F. Ogbuagu (President/Founder), Ambassador Joy Ogwu, Professor Uche Amazigo, Mrs Carol Ndaguba (Barrister at Law), Ms. Chinedu Anugo, Professor Echendu Dolly Adinma, Eze Festus Odimegwu, Mr. Alex Onuegbu and Ms. Jill Sheffield. A meeting of the Board was held on Thursday, 30th of November, 2017 at the C4C corporate address. This was followed up by a Resource Mobilization strategy Meeting with one of our board members, Eze Festus Odimegwu on Friday, 15th December, 2017, at the same residence. The final meeting for the year was held on Monday, 18th December, 2017 at the residence of Eze Festus Odimegwu. Each meeting was a resounding success and major achievement(s) recorded include the pledged commitment of each Board Member to the success of C4C and its Initiatives. Since the establishment of our Abuja office, our management team has grown, evolved and developed within the year. We were blessed with bright young minds who kept the engine running with innovative ideas in achieving the C4C vision. Our goal as an organization is to inspire & empower every young person towards positive change and development, so much so that we are proud of the latest additions to our team in year 2017. Although we are an international organization, we have been able to successfully plant our roots deeply into the Nigerian soil. By our engagement with other organizations here, and partnering on a couple of projects, C4C has carved its name into the Nigerian Industry of civil society organizations. The founder C4C, Dr. Kechi Ogbuagu was interviewed by the Lux Terra Foundation, headed by Rev. George Ehusani. It was an insightful look into the world of C4C and how much potential we possess in creating the change we need. We also celebrated the appointment of Dr. Kechi Ogbuagu as the chair of the Senior Expert Advisory board of UNFPA. C4C is the secretariat of this distinguished Expert Advisory Board and has continued to successfully provide all secretarial support which has been very significant in making the functions of the Board so successful. Towards achieving the launch of the C4C Global Entrepreneurship Fellowship Programme (GEFP), we have faithfully worked towards having constructive partnerships, which we have greatly realized with partners such as the United Nations Population Fund (UNFPA), the Population Council, Amani Institute (Kenya), Abuja Literary Society, Startup Grind, Ashoka International, Seed Star Academy Lagos Institute, Seed Star World (Switzerland), Shehu Musa Yar’ Adua Foundation, and the Business Development Bank of Canada. 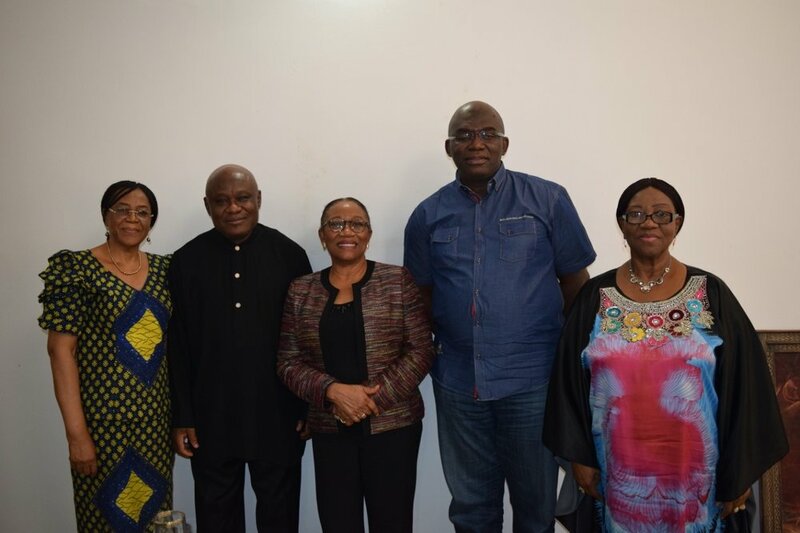 Another strategic partnership formed was with Professor Friday Okonofua, pioneer Vice Chancellor of Ondo State University of Medical Sciences and Founder of Women Health and Action Research Centre, a non-profit organization situated in Benin City, Edo State. We are certain of the great results these collaborations will yield. In line with our goal of solidifying partnerships/collaborations, plans had commenced towards an official trip to Ondo City, with the aim of visiting the Research institute of the Ondo State University and also arrive at concrete ways at which Professor Friday Okonofua & his team can partner with C4C as regards our projects & initiatives. This trip is set to hold in 2018, and plans have already kicked off in ensuring a successful output. Also, we have been able to build a virtual resource centre through blog posts channeled at capacity building in the area of business and entrepreneurship. Resource documents have been critically drafted which will aid the successful run of the fellowship programme. The selection criteria for candidates, curriculum, concept notes, are amongst the resource documents already decided upon. A few entrepreneurs such as the Frank de Tenor (Opera singer), Mr. Adewale Aladejana (CEO Sapphire Scents) and Senator Joy Emodi have been interviewed and videos will be launched with our YouTube page showcasing these entrepreneurs. These interviews are aimed at inspiring young people in starting their own business, at the same time educating them on how to go about achieving a success in start-up. Furthermore, steps have been made to towards a formal Launch of the Entrepreneurship Fellowship Programme, which is tagged ‘Galvanizing a Movement for Young Entrepreneurs in Nigeria’. It will be a National Conference centered on the formal launching of the C4C Global Entrepreneurship Fellowship Initiative, and also an avenue to inspire a movement of young Nigerians who want to start their own business through the plenary and parallel sessions with well established entrepreneurs who are trailblazers in their fields. In line with this, we are working towards a workshop to hold in August, 2018. This will serve as the first part training for our selected candidates, who will later on be recipients of the seed grants. Hence, the selection criteria have been drafted, and selection process will begin soon. In our effort to strengthen actions, of private and government organizations at every level, towards making necessary and adequate investments in youths in Africa, C4C launched the Demographic Dividend and Research Initiative. Our mission is to ensure research into, and documentation of efforts made so far by individual AU countries towards investments in youth, ensuring accountability, best practices and a call to further action. 2. Partnerships and planning towards a Monitoring and Evaluation Workshop where the key pillars of DD (education, health, employment and empowerment) will be evaluated and indicators of success per country agreed upon. We also partnered with the National Population Commission, UNFPA and Population Council in finalizing Nigeria’s road map on Harnessing Demographic Dividend through investments in the youth. We worked, as part of the steering committee in ensuring the success of the event which was held at the Banquet Hall, Presidential Villa, on Thursday, the 6th of July, 2017. It is a year now since we improved on our Facebook, Twitter and Instagram pages. Posts, as relative to our vision are being put up frequently, and follower base has increased compared to the start of 2017. We have so far, had more likes and viewership on our platforms. Also, the C4C website has been duly improved upon and updated, with more icons included such as Our Initiatives and Take Action links. Our social media team comprises of apt and bright young minds that are abreast with the trending issues of the global community. Our own views have been channeled at the many issues and happenings. Hence we had put up contents about them alongside brilliant posts that we believed will interest young people/minds. We were also actively involved in the social media strategy employed during the launch of Nigeria’s road map on Harnessing Demographic Dividend through investments in youth. C4C’s social media handles which are fully launched and functional are as follows; Instagram (@converse4change), Twitter (@Converse4Change) and Facebook (Conversations for Change. This initiative address the societal challenges and inequality issues that young men and women have to put up with and also serve as a means of providing much needed support to achieve their full potential. With that in mind, plans and activities have commenced towards the first ever Club 12 & Conversations for Change (C4C) Joint Annual National Conference for the empowerment of the young females, tagged- “Challenges and Opportunities for the Young Female professional/ Entrepreneur”. Logistics towards the meeting are greatly being managed, until the event which is set to hold in 2018. The aim is to inspire and empower young women as they deal with life’s challenges and strive to achieve their full potentials. The event will take place on Thursday, the 15th of February, 2018 at Chida Events Centre, Utako, Abuja. This will be an annual event; hence the conference will pave way for many more still to come. Also, there are blog posts on various topics that matter to young men and women from branding to financial management, networking, career building and self-protection/self-development. We have intensified our efforts towards making each initiative a success, and we believe that we are on the right path in making the vision a reality. In a nutshell, 2017 has been a successful and productive year and we are grateful to every partner, board member and management team for their efforts and continued support even as we are geared to achieve more in 2018. Newer PostPhoto Speaks; Picture excerpts from the Entrepreneurship Initiative Official Launch.